Discover and visit Codorniu Cava Winery, the oldest family business in Spain with more than 460 years of history dedicated to creating wines and cavas. Cava is a sparkling wine of Denominación de Origen (DO) status from Catalonia. It may be white (blanc) or rosé (rosat). Only wines produced in the traditional method may be labelled "cava"; those produced by other processes may only be called "sparkling wines". About 95% of all cava is produced in the Penedès area in Catalonia and the two major producers are Codorníu and Freixenet. In the past, cava was referred to as "Spanish champagne", which is no longer permitted under European Union law, since Champagne has Protected Geographical Status (PGS) and Spain entered the EU in 1986. ] Today it is defined by law as a "quality sparkling wine produced in a designated region". The Catalan word cava means "cave" or "cellar". Caves were used in the early days of cava production for the preservation or aging of wine. Catalan winemakers officially adopted the term in 1970 to distinguish their product from French champagne. 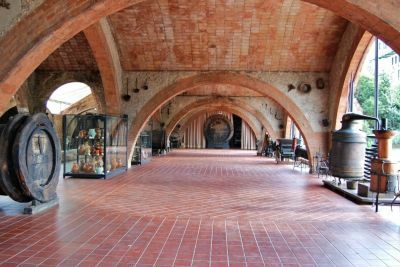 Codorníu has developed a complete range of wines on their premises at Sant Sadurní d’Anoia, said premises being declared a National Artistic Historical Monument in 1976 as they represent a key piece of work of Catalan modernism, erected by the architect Puig i Cadafalch. Codorníu represents the history, tradition, passion, innovation and know-how of a family business with more than 450 years of history and which is still a leader for quality Spanish wines and sparkling wines in this day and age. Your private English-Speaking Chauffeur will pick you up from your hotel or cruise ship port. Visit the famous Cava Winery Codorniu, located outside of Barcelona in Sant Sadurni D`Noia, the Penedes wine region. Then your chauffeur will take you to your Hotel or cruise ship and say the final goodbye.